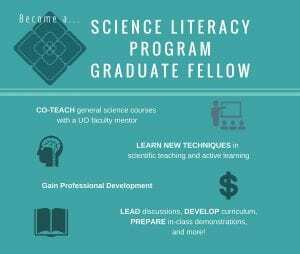 Graduate students wanting to expand their graduate experience and improve their teaching abilities are invited to participate in the SLP Graduate Fellows program. Over the course of one term, graduate students are paired with a faculty member to assist in teaching a course in their area of study. Fellows develop skills in teaching, mentoring, and assessment, while also building their understanding of evidence-based teaching strategies, active learning, and emerging best practices in pedagogy. Each fellow receives a stipend and tuition remission equivalent to their department’s GE appointments. This is an excellent opportunity to prepare for a career in academia or any public-facing scientific communication field. Applications for Spring 2019 are closed.